Although photography had started in 1838, it was not widely used in 1840 when Queen Victoria married Prince Albert. So fourteen years later in 1854, they dressed in their wedding clothes again and finally got their wedding picture taken. By today’s standards, that seems crazy and I’m glad it still doesn’t work like that because after fourteen years I know I wouldn’t have fit into my wedding gown. A wedding photo is a treasured memory. 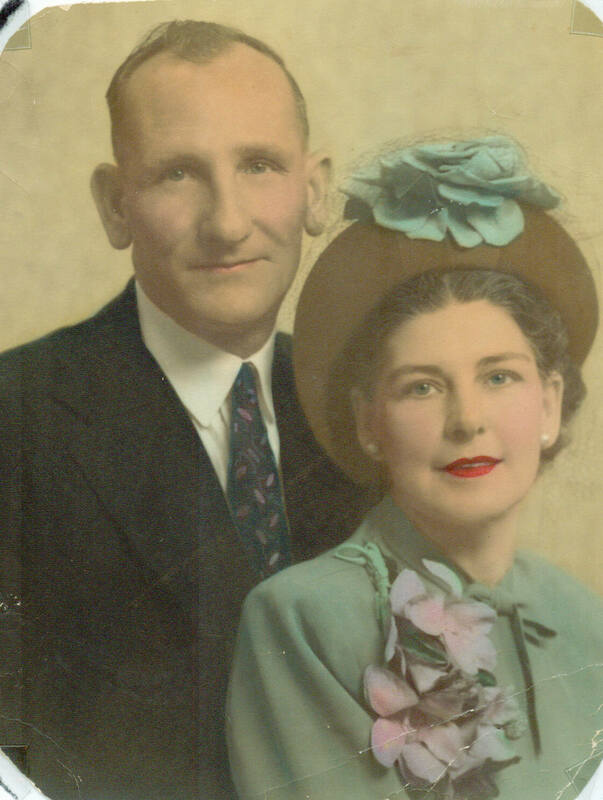 I have a couple of wedding photos in our family history but some of them I only know are wedding photos because I was told that they were when my grandparents gave them to me. So it made me wonder if there are many “wedding” photos out there that people don’t realise they have. It is quite rare to have a wedding photo in this period of time. (Especially if you consider that even royalty had to go to a studio in 1854 to get their own photos done.) Photographic equipment was quite bulky and complicated. It was very hard to get the lighting right and developing the photos could require the equipment to be on hand. The photos were very fragile and had to be kept in special casing behind glass. From the 1860’s, portraits started to get taken at the wedding venue with the bride and groom in their wedding attire. A bride may give guests a wedding photo as a souvenir of the wedding. In the 1880’s photo albums become very popular and many were given as a wedding present. Many photos survive due to photo albums being around. By the 1880’s photographers started to include other members of the wedding party. Kodak revolutionised photography with the release of the Box Brownie. The ability to freely buy photographic equipment that only required you to press a button meant that theoretically anyone could get a photo taken. Still lighting was a problem and flash bulbs had not been invented. The use of powder to light a scene was still quite dangerous. Around World War Two, the idea of capturing the whole wedding started. People in that era were exposed to magazine photo spreads of candid shots taken of royal and celebrity couples on their wedding day. Also many military trained photographers back from the war went on to use their skills photographing weddings. The technology of the flash bulb allowed photos to be taken in most light and it meant that if photographers wanted to be competitive they would have to go to the wedding. The documentary style of photography that means photos are taken of every part of the wedding started around the 1970’s. There is less formal posing and more candid shots. Although many couples over time moved away from photographic studios for their wedding shots, there were still many circumstances when a couple would still visit a studio. If a couple did get a photo taken it would be before or after the wedding and the couple would wear their best dress/suit to a photographic studio. Is that a wedding dress? A wedding dress has not always been a dress that is only worn once. A good dress would be refashioned to be worn a number of times. Although Queen Victoria brought about the fashion of a white wedding dress, this was very extravagant. Some brides may have worn a white wedding dress but the practicality of wearing a white dress meant that other colours were more popular. Also the fashion of the day influenced what colour this expensive dress may be in too. Wedding dresses are handed down in families, so looking at the dress itself may not be the best way to date a wedding photo. You need to look at the accessories like the veil and the husband’s attire to make sure that the right time period is chosen. There are many ways to date a photo from the fashion. Wikipedia has many articles detailing the fashions of different time periods and Flickr has many photos available to view to give examples of fashion in different time periods. Look at dates of marriage in a family, this can start you being able to identify a couple and their wedding photo. The family is usually posed on the side of the person they are related in a wedding portrait . Look at what accessories are in the photo – a corsages can be a good clue of a wedding photo. In the 1880’s wedding gifts would be laid out and photo’s taken. If you have these types of photos this is a good way to see if you have any family heirlooms that may still exist today. If you have the date of the wedding from your genealogy, you may be able to find out the names of the other family members by searching newspapers for the announcement. Family Bibles were often given as a present at weddings. Check yours to see if there are any wedding details in it. The poem about colours must have even influenced my own grandparents. “Married in blue, you will always be true” put two grandmothers into their best blue dress for their wedding photo. When I was fifteen, my grandmother made a point of giving the above photo to me for my birthday. At the time, I almost found it strange to be given a photo from a gift giver. But I realise now that if she hadn’t I may not have had that photo at all and what a sad thing that would have been. Make sure that you look closely at your family photos and see whether you may be missing a significant even in your families life. Good luck. Last updated by Nicol Warren at November 10, 2015 . Dating wedding photos, Family History Photos, History of Photography, Wedding photos. Bookmark.